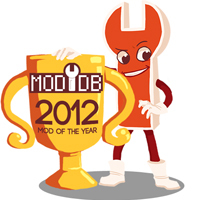 Black Mesa wins Mod of the Year 2012! The Black Mesa devs are extremely proud and gracious to announce that the Mod Community has voted Black Mesa as Mod of the Year, 2012! Thanks a ton, folks! You make it all worth it.